Tonight I did cards for all my friends to send it for them. It was much fun! I write much on English and very to get tired.... I think, that I need to take from a shelf my English language textbooks and to start over again. I know that Russian very difficult to study and it is very similar as Greek (therefore for the Russian student studying Greek very easy!) I to think that English is much easier... 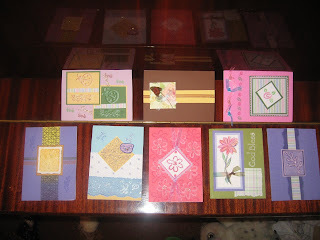 But when I to write my letters and cards my opinion varies!!!!.... It is difficult.... For me.... But I to enjoy it because people which I love to speak on this fine English language! 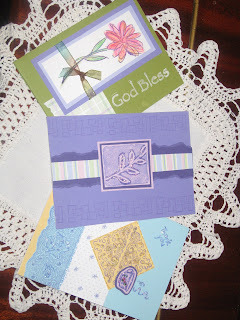 The cards are lovely! You did such a nice job! 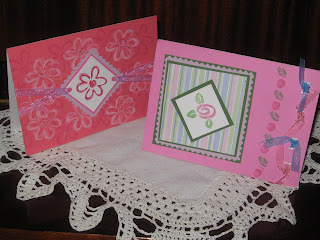 Nika, your cards are lovely! What a wonderful way to minister God's love to others! 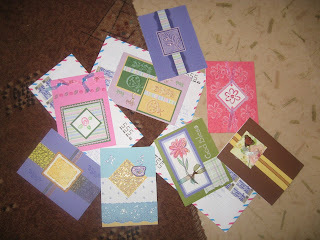 Hello Nika, I think you have made beautiful cards for your friends, I also think that your English is very good. Your cards are very nice! Don't worry about your English, you are doing a fine job. It's not an easy language to learn so try not to get too frustrated. I love reading your blog and emails. I enjoy getting to know you. 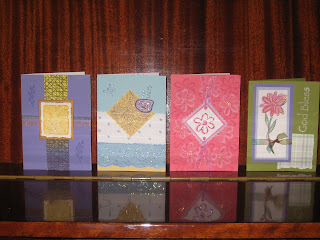 Pretty cards and beautiful colors! Thank you for writing me. English is a difficult language, but you are doing wonderful so far.